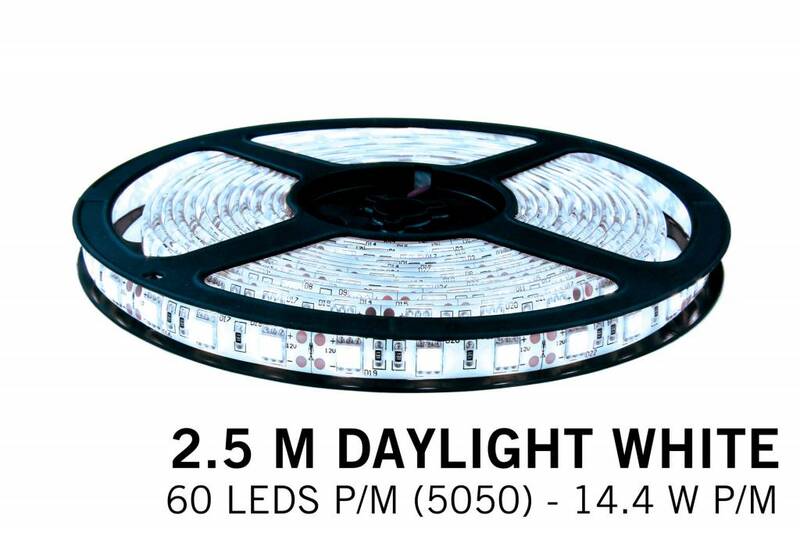 Ledstrip Cool White (CW): 300 super bright daylight type 5050 LEDs. This LED strip perfectly complements the bright daylight with fresh color temperature of 6500K. Perfect for an extra bright accent in a daylight room, at an aquarium or as a remarkably fresh white lit store window. For a beautifully finished result and a better light distribution, place this LED strip in an aluminum profile. This LED strip profile can be found here. We constantly invest in research for the best and brightest LED strips for a competitive price. This will be noticed in the high brightness and durability of this product. 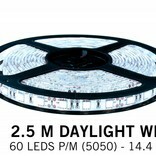 • 2,5 meter cool white LED strip with 300 pure white daylight LED's, 60 type 5050 LED's p.m.
• 12V / 72W / 6A / 14,4W p.m.